Nirvana are often remembered for getting loud, brass, and destructive. But they showed off their softer side with this iconic performance. 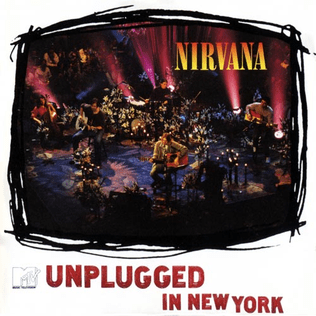 The show has gone down as the best unplugged performance in the MTV history, but since it was less than a year before Kurt’s death so many people have tinged the event with death and depression. Everything from the setlist to the stage up has been picked apart and analyzed so much it’s hard not to watch it and wonder if Kurt was saying goodbye. But after being gone for 21 years, it’s time to stop viewing it through that lens. Let the music take you back to 1993, before the death, before the mystification of Kurt Cobain. There were so many risks involved with the show. Lots of people from MTV didn’t know how well their music would work in an acoustic setting, Kurt and Dave were having disagreements about his playing beforehand, and the setlist was filled with obscure covers. At the time no one knew whether or not it was going to work. You can even hear and see the apprehension of the band during the uncut performance. Throughout Kurt looks nervous; he often sits there not saying anything or looking at anyone while trying to figure out what to play next. It comes off as cold indifference or boredom, as if he didn’t care at all, but when see him sign some autographs after the show and watch the behind the scenes of it on the DVD, you can see how much this event mattered to the band. Also, there are times when he seems to get lost in his own world or just spaces out, as if he doesn’t want the cameras to be there, which could’ve been true. According to sources, he was afraid the crowd wouldn’t have a good time and that made him nervous. It’s kind of amazing to consider where the band was at this point at their career, yet here’s Cobain still getting nerves about the whole thing. As everyone came to learn, Nirvana excelled in the acoustic setting. There’s no doubt that songs like “Polly” and “About a Girl” would work, but it was awe inspiring to hear“On a Plain,” “All Apologies,” and “Pennyroyal Tea.” It wasn’t just them playing these songs acoustically, but giving them new life. Once the loudness and fuzziness was taken out the songs took on a different sound, different feel. The muted setting also allowed Kurt’s vocals to really be heard. He’s always had a great scream, but now we could actually hear him sing. One of the vocal highlights is “Come as You Are” where he drags out every word. You can really hear the grit and rawness of his voice and it’s chilling. Also, there are a few mistakes during the performance, such as Kurt not remembering lyrics right away, but it makes the whole thing more real and raw. It just made it feel like they weren’t trying to come off as perfect, they were doing what they wanted. Even though the band did some of their songs, the covers are the best part of the performance. “Man Who Sold the World” is one of the best moments from the show and has since gone done as being better than the original. “Jesus Don’t Want me for a Sunbeam” has a bittersweetness to it that was missing from their electric rendition and Cobain pushes his vocals on “Plateau” where he takes on a strange country accent. Of course the most chilling cover is the closing track “Where Did you Sleep Last Night?” It being the last song of the night, Kurt gave more than his all as he belts out the chorus one last time. He stretches out his vocals so much it sounds like they’re going to snap. It’s such a strong, heartfelt delivery that he knew he couldn’t top it when he was asked to do an encore. Of course now the cover has taken on different connotations, but I’m not focusing on that. That particular performance was great because no one knew he had that kind of power in him. He took the somber mood of the track and projected it so perfectly to make everyone watching and listening feel it themselves. The setlist, dark lighting, and candles takes viewers into a world of lament and sadness, but judging from the banter everyone seemed to be in good spirits. The uncut version features lots of setup between the songs where Kurt is joking with the audience and his bandmates. Some of the funniest moments include him and Krist discussing an episode of Davey and Goliath and how the show scared Kurt as child. Another is when someone in the crowd yells “Nail it down!” Kurt has no idea what this means and responds “You want us to play Nine Inch Nail songs?” We always hear so much about what a fun, witty guy Kurt was and here it is during this performance. Even when you listen to the album version, you still get to hear some of this intermission chatter giving you the feeling of actually being there.It’s great that MTV finally released the entire performance on DVD allowing us to see what was unaired. As a bonus, the broadcast version of the show is also included. There are also some great behind the scenes footage and rehearsals of certain songs providing more insight into the event. Whether you get the DVD or listen to the show on CD, you get the same experience. Both are must haves for the Nirvana fan. After all these years, the performance still holds and is truly one of their best of their career. It allowed the world to see these guys weren’t always about playing loud, fast, and hard. They had the ability to reinvent their songs, tone things down, and sound damn good while doing it. During this time of remembrance for Kurt, it’s great to watch an amazing, insightful show like this one and listen to all the great music he left behind.